Comments: The last of the Odhams Press 'Power Comics' line to be launched (the others being, in order, Wham!, Smash!, Pow! and Fantastic). With each successive Power Comic title, the amount of British-produced content had reduced in favour of comparatively cheap, and popular, reprints of US Marvel comics; Fantastic only had a single UK strip, and Terrific, in the first two issues at least, had none. 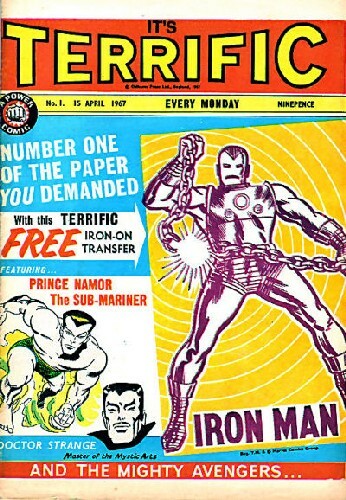 Instead, when it launched on 15th April 1967 it featured Namor the Sub-Mariner from Tales of Suspense, the Avengers from The Avengers, and Doctor Strange from Strange Tales, plus a back-up "twist in tale" story Journey into Mystery. The first and only non-reprint strip began in issue 3 with the eerie case of The Living Dolls being investigated by special agent Don Starr; though Don soon solved that mystery, new cases presented themselves. The series was finally renamed after him in issue 27, and he remained in Terrific until the final issue. As for the US material, Avengers also remained in Terrific all the way to the final issue, and Doctor Strange lasted the run too, skipping only issue 20, but Sub-Mariner bowed out in issue 22, to be replaced by Giant-Man stories from Tales to Astonish. Between 27-32 and 34-36 Tales of the Watcher from Tales of Suspense joined the title, and the Wasp flew into solo tales in 41 & 42. February 3rd 1968's issue 43 was the last Terrific; a week later it merged into Fantastic, carrying over the Avengers and Doctor Strange strips to that title.